There is no consensus on whether inspecting the terminal ileum is a necessary part of every total colonos-copy. Intubation is often difficult and requires an experienced examiner. However, there are some patients in which pathologies are present only in the terminal ileum (e.g., Crohn disease). And, for certain indications (diarrhea, suspected chronic inflammatory bowel disease, unexplained gastrointestinal bleeding), examination of the terminal ileum is essential. At our center we therefore aim to perform an intubation of the Bauhin valve on every patient, in part given the benefit of practical experience gained by the examiner in performing this technique. The terminal ileum is reached after intubating the ileocecal valve. As a rule, no more than 10-15 cm of the terminal ileum can usually be viewed. The caliber of the terminal ileum is significantly thinner than that of the colon. The transverse folds typical of the small proximal intestine are less pronounced in the terminal ileum or lacking completely (Figs. 6.34, 6.35). The mucosa is distinctly different from the colonic mucosa. Instead of a smooth and reflective surface, it is velvety and granular, this is caused by the shaggy relief of the ileum villi, which are usually visible close up (Fig. 6.36). Blood vessels are generally fine and thin and are not as easily distinguishable, or in much detail, as in the colon (Fig. 6.37). Especially in younger patients, aggregated lymphatic follicles (Peyer plaques) are often visible as small, raised polyplike forms; pronounced forms are also referred to lymphatic hyperplasia, which, usually, is not a pathology (Figs. 6.38, 6.39). Fig. 6.34 Normal terminal ileum. Transverse folds are barely visible and the mucosa has a velvety, matt surface. Fig. 6.35 Normal terminal ileum with somewhat more pronounced transverse folds. Here, too, the fine-grained and velvety mucosal surface is clearly visible. Fig. 6.36 Ileum mucosa viewed from the side close-up, showing the visible surface relief of the villi. Fig. 6.37 Close-up view of the ileum mucosa. Velvety surface structure, created by the villi. 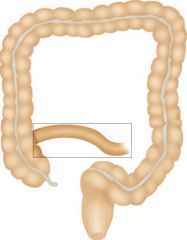 The blood vessels underneath are not as easily distinguishable as in the colon. Fig. 6.38 Ileum mucosa with individual lymph follicles, visible as raised lentil-like forms. Fig. 6.39 Lymphatic hyperplasia in the terminal ileum with small, multiple lymph follicles. ► Forcible air insufflation in the terminal ileum can cause discomfort to the patient. Air should be insufflated sparingly and suctioned intermittently, which can also serve as a check of the elasticity of the ileum. ► Intensive contractions of the ileum and its sometimes foamy contents (due to reabsorption of bile acids) can hinder examination. If these conditions prevent sufficient examination, n-butylscopolamine (note contraindications) may be injected for the former, and for the latter, an over-the-counter antigas drug (e.g., simethicone) can be given to increase visualization. 1. Herbay A. Anatomie, Entwicklung und Fehlbildungen. In: Caspary W, SteinJ (Hrsg.). Darmkrankheiten. Berlin: Springer 1999; pp. 3-16. 2. Keljo D, Squires R. Anatomy and anomalies of the small and large intestines. In: Feldman M, Scharschmidt B, Sleisinger M (eds.). Gastrointestinal and Liver Disease. Philadelphia: Saunders 1998; pp. 1419-36. 3. Rex DK. Colonoscopic withdrawal technique is associated with adenoma miss rates. Gastrointest Endosc 2000;51:33-6. 4. Saunders B. Colonoscopy: Basic instrumentation and technique. In: Classen M, Tytgat G, Lightdale C (eds.). Gastroenterological Endoscopy. Stuttgart: Thieme 2002; pp. 135-51. 5. Silverstein F, Tytgat G. Praxis der gastroenterologischen Endoskopie. Stuttgart: Thieme 1999; pp. 18-26. Which of ileum or colon has villi?